Many companies in New York City rely on office security systems to keep their assets and intellectual property safe at all times. Large corporations, law firms, healthcare companies, banks, and other types of businesses typically install an integrated security system. It is recommended to install a combination of security cameras, access control, and intercom systems to allow holistic monitoring and complete control as to who has access to certain areas of the office building. An integrated system accomplishes this goal. Surveillance cameras installed in a busy working environment can help reduce the threat to office property and deter possible crimes. They enable security personnel to monitor ongoing activities within the property efficiently. They secure certain areas of the building that may not be visible from the main area such as elevators, stairwells, storage areas, etc. They also helps monitor visitors, track employee working habits and are an effective tool to reduce employee theft. Additionally, properly installed office security cameras can serve as protection against unwelcome intruders especially during non-working hours. Security camera systems can be very helpful if integrated with door access control and intercom systems. These systems will only allow authorized individuals to access certain parts of the building. Card access control and biometric systems are beneficial to banks and large corporations as they will help secure sensitive information and prevent a data breach. Certain locations will only be accessible to employees who have the clearance to do so. This is highly beneficial to companies who are keeping sensitive information like for example financial institutions which need to keep banking information. It can be a serious problem if such information gets into the wrong hands. Should a security incident happen, recorded surveillance footage with hi def cameras is an essential tool to help track responsible individuals. The clarity of detail as small as license plate numbers on cars can easily be captured too. Moreover, the installation of security camera and access control systems for office buildings also helps save money. An integrated security system helps save on employee wages by limiting the need for extra security personnel to supervise less trafficked areas. Another advantage of installing access control and intercom systems is that they can be customized according to the office’ security needs. When looking at installing a security system for your office, it is important to pay careful attention to the company you are considering. They should be knowledgeable about the different types of office security systems and must have extensive experience working with different types of businesses in New York City. They should also take the time to meet with you personally and answer all of your questions thoroughly. Choosing the best security systems company in Manhattan can help design a security plan that suits the level of security required for a specific type of office building. 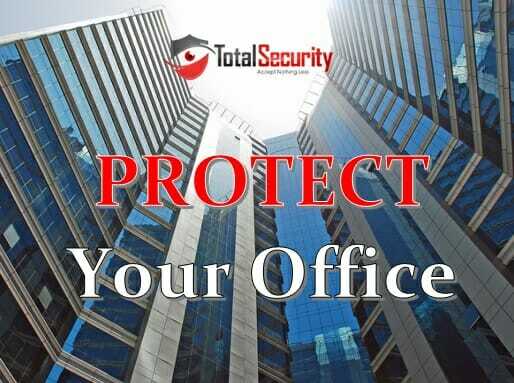 Total Security offers a range of security solutions for office buildings and busy working environment. Call (516) 775-2304 today for a FREE on-site evaluation.